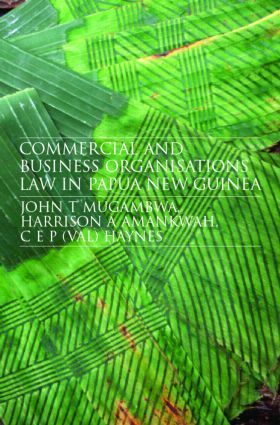 A timely and apposite treatise on Papua New Guinea’s economic environment, this book explores business organizations law and various aspects of commercial law in Papua New Guinea in a readable and informative style. Business and commerce is the twin engine that propels the economy of a modern nation. They ensure steady economic growth and development. In an age of globalization, they assume even greater importance than at any other time in human history. A nation risks being marginalized or left behind in the race for a share of the world economic market unless it ensures the stability of its business and commercial sector. Trade regulation, good governance and democratic institutions go hand in hand in guaranteeing political and social equilibrium. As such the laws designed to facilitate trade and commerce are a vital component of the political and social equation. This is a valuable book for law students, legal practitioners, accountants and business executives, not only within Papua New Guinea, but also in Australia and throughout the South Pacific.